Telnic submits a Sponsoring Organization Proposal and Application to operate and manage a new generic top-level domain called .TEL that is dedicated to communications-over-the-Internet. The vision of .TEL, a fundamental new communications domain-addressing platform that will enrich the Internet, was conceived in the mid-90�s, as was its parent Telnic (the .Tel Network Information Center). From these early beginnings Telnic has taken a long-term view on the development of the .TEL concept, primarily because: (a) technology and perception has had to catch-up with the idea, and most importantly (b) the need to adopt .TEL into the DNS as part of the then IANA, and now ICANN new gTLD initiatives. Telnic was created to make .TEL happen. Therefore the process of structuring and building the Telnic Organisation has and will be ongoing and evolutionary. This is plainly because Telnic and .TEL are contingent in many respects on the sanctioning of new gTLDs, and the parameters and requirements that go with it. As a result, Telnic is currently a limited operation focused and ready on the sole objective of making .TEL a reality. Most elements to achieve this aim are in place, including: an extremely high-level business plan; human-resources in place and in-waiting who are experienced and qualified in all necessary fields; and importantly sufficient financial resources and commitment ready to ensure that the new Telnic Registry will be unequalled to fulfil the requisite responsibilities to launch the project, and execute the proposal described in this application. Telnic is therefore in the category of �Sponsoring Organization Proposing to be Formed�.� Details of Telnic�s current staffing level and resources, including funding, are given in the appropriate sections of this proposal. We are presently a UK centric organization, with plans on becoming acknowledged and accepted as a universal organization and registry for .TEL, servicing the whole Internet community - be it in developed countries or developing countries. As part of our long-term planning and development Telnic has considered the many and varied pivotal issues that will have a bearing on the long-term development and stability of a new namespace for .TEL. We have considered and planned for all legal aspects, all technical aspects, all policy formulation aspects, and importantly all intellectual property aspects that could restrict or hinder the implementation of the .TEL namespace. In this respect Telnic has comprehensively protected the integrity of .TEL. Telnic propose the creation of a new .TEL gTLD that will be task-related specific to Voice-Video-Data. It will represent the next-generation of point-to-point addressing for voice-video-data. By voice-video-data we mean that as the world enters an all Internet Protocol (IP) environment when voice (voice-telephony) will become just another data element, it will then be possible to combine this voice data will other data such as video, imagery, and/or messaging to provide creative Internet solutions and services that go far beyond conventional communication services. These new exciting developments are being driven by the Internet, and in particular the emerging mobile-Internet, and in parallel with these advances and convergences we are seeing the emergence of a whole new-generation of devices that will transform how we use and interface with the Internet. These devices, in their many forms - whether personal communicators, wearable-devices, PDA types devices, desk-top terminals � demand a new dedicated domain-name addressing system such as .TEL. The use of .TEL as a communications addressing scheme opens up new frontiers in the use and application of communications devices and networks. It will positively compliment and grow DNS for virtually all Internet end-users, service providers, application developers, even hardware producers. .TEL has the potential of fulfilling most national, regional, and global Internet addressing specific to communications � that is Internet communications in the broadest sense. It will be a simple, universal, flexible, scaleable, versatile, intuitive, and user-friendly addressing structure. � It will enhance DNS and enable the development and deployment of a wide range of new Internet applications, products and services. � .TEL will be user-friendly and allow the flexibility to use more or less any characters: letters, digits, phrases, or a mixture of letters and digits to form domain name addresses � or �Telnames�. � .TEL will allow a sub-addressing structure of country based two-character sub-domain names, ccSLDs, (e.g., us.tel or uk.tel) which will mirror to an extent traditional telephone country and area codes for over 200 countries. � .TEL will create corporate addressing solutions below each corporate .TEL domain name to enable individual company departments to be contacted via simple and flexible communication architecture. � .TEL will extend the methodology of the corporate .TEL solution to domestic homes, whereby any member of a family and any Internet enabled appliance can be contacted through the specific .TEL address mapped to that home. As can be seen from the above, .TEL has the power to become a truly worldwide and universal platform that provides an uncomplicated IP-based telephone addressing system between any two or more Internet enabled devices, or between two or more devices where at least one is Internet enabled. This means that .TEL lends radical new capabilities to how people will �dial� and communicate in the future, and could accelerate VoIP, mobile-computing, UMTS, and many other Internet related advances. � Telnic was incorporated under the name of Ixtel Limited, formed on 22 April 1998.� The company changed its name to Telnic Limited in 1999. � Telnic�s registered office address is at 211 Piccadilly, London W1V 9LD, England. � Telnic�s bankers are National Westminster Bank plc of 169 Victoria Street, London SW1E 5BT, England. � Telnic�s primary legal counsel is Squire, Sanders & Dempsey.� Squire, Sanders & Dempsey is a global law firm, with 700 attorneys worldwide, with a leading telecoms and Internet law practice, based in its London office at Royex House, Aldermanbury Square, London EC2V 7HR, England. � Telnic�s financial advisers are The CHART Group LP (�CHART�), of New York and Paris.� Further information on CHART is set out in paragraph C.2.2 below. � Telnic is an ordinary for-profit company, based in London, and is governed by the laws of England and Wales. � Telnic�s Articles of Association are attached to this Sponsoring Organization�s Proposal. CHART is a private investment company, based in New York, Paris and Dublin, with a shareholder base of approximately 50 influential families from over 20 different countries, in the Americas, Europe and Asia. CHART has acted as incubator for the past nine months, in close relationship with its British investors, who have already spent four years developing the .TEL architecture.� CHART has transformed the .TEL vision into a workable business plan, supported by substantial investment.� CHART has also provided logistical support, and initiated a .TEL proof of concept with Ericsson UMTS Department.� CHART�s partner in charge is Mr. Fabien Chalandon, who is also the nominated CHART director to sit on the Telnic Board of Directors. CHART initiated the fundraising for Telnic in early July 2000, to support Telnic�s application for the launch of a new gTLD. The Telnic share offering is structured to focus on a two-stage fundraising process with both stages committed at the same time.� The first round of finance is to fund the application, with the second round of finance to develop and launch the .TEL registration operation. The fundraising is expected to close within the first two weeks of October 2000.� Based on confirmed indications of interest, Telnic is anticipating first round financing of US$1.5 million to fund the application process.� The second round of financing of US$12 million is contingent upon ICANN granting to Telnic the exclusive licence to operate the .TEL domain name. If ICANN grants a licence to Telnic, the Board may decide to approach investors for additional funding.� Should the need arise, CHART is confident that it can raise further funds from both existing and new investors. Since the announcement by ICANN, in July 2000, of its intention to consider applications for new gTLDs, Telnic has strengthened its organization by recruiting additional executives to assist with the gTLD application. q Christopher Kemball, Non-Executive Chairman. q Alan Price, Founding Director, and Senior Executive. q Cathy Horton, partner of Squire, Sanders & Dempsey. q Fabien Chalandon, Managing Director of CHART. q William Holman, Managing Director of Thomson Financial. The sole purpose of Telnic is to develop, launch, manage, and operate the new gTLD called .TEL. (Please refer to �Policies� section). Telnic envisages the launch of .TEL to be a carefully controlled roll-out.� Telnic�s initial management team has considerable experience of start-up business operations, and of building high-quality customer service operations at extreme speed. Therefore, Telnic considers that .TEL is a concept that possesses universal value to the Internet community, both present and future. 1. The rapid emergence of a wide range of devices.� Internet enabled devices which provide mixed voice-video-data capabilities which are likely to converge with traditional telephone systems will need to be addressed. 2. The rapid growth of VoIP.� Some forecasts say that the development of VOIP could represent as much as 30% of telecom traffic by 2003. (c)������� an increasing number of electronic devices in the office and the home will become Internet enabled, and therefore require an IP address. In summary, the .TEL concept when taken to its logical conclusion embraces the entire Internet community, it being the right time in the Internet�s evolution for this proposed new gTLD. Telnic�s business proposal is relevant to the global Internet community.� To ensure that a wide range of interests within that community are taken into account in the formulation of Telnic�s commercial and technical policies, Telnic proposes to create a Policy Advisory Board, to advise Telnic�s Executive Management Committee and the Board of Directors. Telnic is seeking an industry leader to chair its Policy Advisory Board.� Cathy Horton, a leading Internet advisor and partner of Squire, Sanders & Dempsey has agreed to serve on the Policy Advisory Board. The Policy Advisory Board will operate separately from Telnic�s management structure, and will be able to set its own terms of reference, in consultation with ICANN.� Cathy Horton will be responsible for ensuring that the members of the Board represent as wide as possible a range of interest groups within the Internet community.� The attached chart (Fig. C-1) shows how the relationship between Telnic, the Policy Advisory Board, ICANN and the Internet communities will be structured. Internet communities will be represented on a local level within each territory by the creation of user groups, and an overall international user group, comprised of territorial representatives, will provide input on policy issues to the Policy Advisory Board. Telnic is aware that predatory pricing in relation to domain names and the development of domain name space generally could affect the development of the Internet.� Whilst Telnic has a responsibility to its investors, Telnic proposes to develop pricing policies, particularly for private individuals, which keep costs of domain name registration and maintenance as low as possible. Telnic intends to operate a fair pricing policy.� Telnic will also ensure that its business partners and suppliers are able to supply Telnic services to a verified service level. Nevertheless, Telnic�s Board of Directors is aware that additional issues relating to Telnic�s proposed services and fee structure will need to be considered in more detail in the future. Telnic is also aware of the example of CORE, which has introduced a policy of voluntarily donations to ICANN by way of �giving something back� to the Internet community. The financial performance of Telnic is subject to uncertainty at this stage. If ICANN grants a licence to Telnic, it will still be difficult to assess the full development potential of the .TEL domain name space, as this will depend on a number of factors, including the terms of any such licence, and the acceptability of the concept by the Internet community once launched.� The financial projections which have been provided herein must be treated as largely illustrative until the terms of any licence granted becomes known. Both Telnic and ICANN could nominate independent trustees for The Telnic Foundation. It would be the responsibility of the trustees to establish detailed policies for The Telnic Foundation, and to administer its finances in an agreed manner to benefit the Internet community.� The funding of The Telnic Foundation could be based on a registration volume formula, or a share of Telnic�s profits, once Telnic has satisfactorily recouped start-up costs. Telnic believes that it will be in the interest of the Internet community at large if it conducts its activities with complete openness and transparency. Use of the Telnic.org website will be central to this openness. As a company regulated by English company law, Telnic is obliged by law to publish its Annual Report and Company Accounts at Companies House.� These financial records will be available for public inspection. The creation of a Policy Advisory Board, and a system of user groups will ensure that the operation of the system is subject to wide scrutiny.� The proceedings of these various bodies would be published on the Internet, to ensure a wide consultation process as issues emerge and are identified for decision-making. Please refer to appendix for CVs. This section C9 is covered in detail in sections 16 to 20 of the *Proposed Articles of Association attached to this document. All references below are to the Proposed Articles of Association. *��� The appendix includes both the existing Articles of Association and the Proposed Articles of Association.� The latter will be approved by the Telnic Board at the next Board Meeting scheduled to take place on October 12th� 2000. 2.�������� individuals who have specific skills particular to the success of the operation. This section, including Powers of Directors, Interest in Contracts etc., is dealt with in detail in Sections 16 to 20 in the Articles of Association which is appended to this document. We are proposing full policy and guidelines in further sections. The policy making procedures of the Company relating to the Directors, and including the proceedings of the Directors, i.e., quorum, alternates, casting votes, telephone meetings etc., are dealt with in Section 18 of the Articles of Association which is appended to this document.� Please refer to the Policies section of this proposal. For the purposes of Telnic�s application, funding has been arranged in the sum of US$1.5 million, with further funding of US$12 million agreed on a second round. CHART has been responsible for organizing this fundraising. (See separate letter from Chart). Investors in Telnic will come from the international Internet community. The whole basis of this proposal is that we see the .TEL space as a way to streamline the method, and simultaneously reduce the costs, of communication throughout the world.� To this extent, we have attempted to price the service accordingly, more as a public service rather than an expensive and exclusive facility.� Therefore, we have built in assumptions - in an open and deliberately nurtured competitive .TEL market place - which will leave very small margins for the operators of the service, including Sponsors, Registry Operators, and possibly Registrars and Resellers. Also, we have assumed that the Registry Operator will only deal with Accredited Registrars and not directly with the public, thereby providing, as soon as is practicable, a high degree of competition and a virtual open playing field immediately. The level of fees in the first years are set at the level of US$10 and US$8 in order to offset the investment required in a start-up operation. For the purposes of this proposal we have assumed that fees would be payable in two year instalments. The company is not yet operational, consequently there are no historical records with respect to audits, annual reports or annual statements.� The summary above is however the culmination of an extremely complex spreadsheet model which includes a detailed P&L by Month, Cash Flow statements, Balance Sheets and a variety of Accounting statistics.� This model is available to ICANN should it be required and we are happy to respond to detailed questions. Both these subjects are dealt with in Article 23 of the Articles of Association (as attached). ����������� Amendments to the Articles of Association is governed by English company law, which, in brief, states that the Articles of Association can only be amended by way of passing a special resolution of the members of the company.� Once the members pass the special resolution, the amended Articles of Associations will require approval of the Board of Directors.� Changes of this nature to the company�s constitutional documents require filing at Companies House. As an English company, certain company documents will have to be filed at Companies House therefore, Telnic�s affairs will be the subject of public scrutiny.� The result is that the affairs of Telnic will always be capable of assessment by ICANN and other interested parties.� Should issues emerge that require adaptation of Telnic policies, these can be discussed, particularly within the remit of the Policy Advisory Board.� Telnic will need to take account of this advice in formulating its ongoing policies. q ensuring that all sub-addressing is implemented in a stable, equitable and consistent manner. q a registry and focal point to co-ordinate and liaise with ICANN and other Internet bodies on a cross-section of applicable matters. With any new gTLD, there is demand to introduce subdomains and to demarcate these along restricted or unrestricted lines, taking into account the many parameters and issues. .TEL is no exception to this. With respect to country code SLDs under .TEL, it is Telnic�s opinion that these should be developed and organized on the basis of being a public service that takes into account national circumstances within the respective country. Towards this goal, Telnic understands the importance of organizing and developing structures that facilitate (a) all guidelines and narrow policies to develop these specific subdomains; and (b) systems for the selection and management of country code SLDs within respective countries. Telnic will put in place a representative system to assist and guide the development of any �small-footprint� guidelines and policies (see section C16.1). Central to this will be the adoption of a fixed Policy Advisory Board, made-up of various experienced and qualified people who are knowledgeable and representative in fields appropriate to .TEL. Telnic believes that the representation and participation by ICANN on its Policy Advisory Board would be both beneficial and productive. This will be on the basis of the following organizational chart. (Please see Fig. C-1 in the following pages). Overall, this is a broad subject that will need to be discussed and shaped in detail with ICANN. 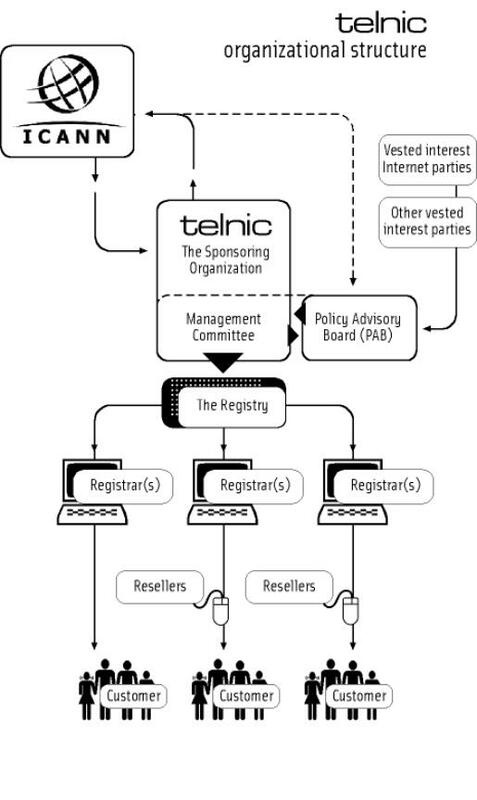 As stated in C16.4 above, Telnic does not wish to deviate from the key principles established by ICANN.� Telnic�s objective is to adopt mainly existing structures to meet the special requirements of the .TEL namespace.� Telnic propose a two-phase rollout for .TEL to create a stable and measured environment for its introduction. This strategy should also allow sufficient time to develop Telnic�s consensus-led guidelines for its various subdomains. �Phase 1� of rollout will be only for second-level registrations. �Phase 2� will be for agreed subdomains. It is in this �Phase 2� that Telnic wishes to over-lay various narrow guidelines and principles. (Please see Fig. C-2 in the following pages). * 'Phase 1' will be approx 12-18 months duration, thereafter 'Phase 2' will be implemented. CcSLDs will be implemented in� �Phase 2�. **� A temporary quarantine will apply in �Phase 1� to ensure that the proper structuring and implementation of .TEL, with all essential subdomain, is done in a stable and coordinated way, considering all factors. The proposed terms of a contract between CentralNic and Telnic are contained in an agreement signed by both parties and included in the Appendix.